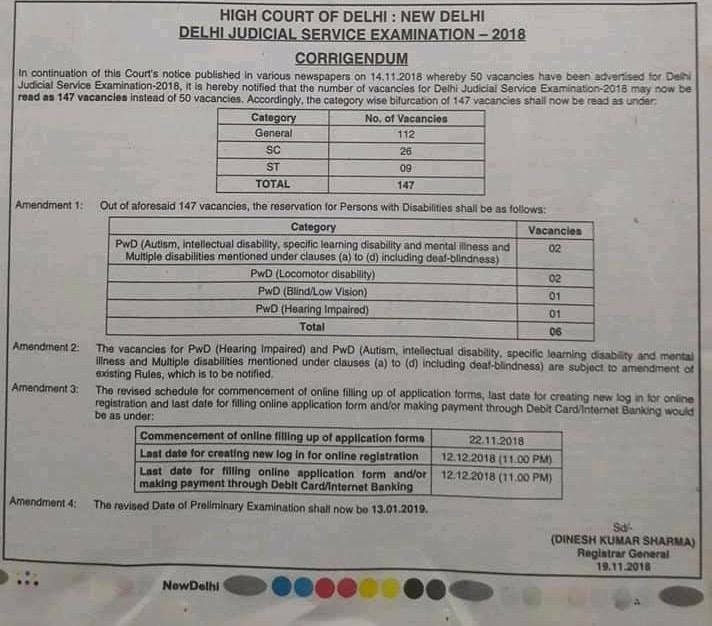 High court of Delhi, New Delhi published the official job recruitment Notification for inviting online application form for Delhi judicial service examination 2018-19. All candidates who hold the eligibility criteria they can fill application form at the official website of Delhi high court. 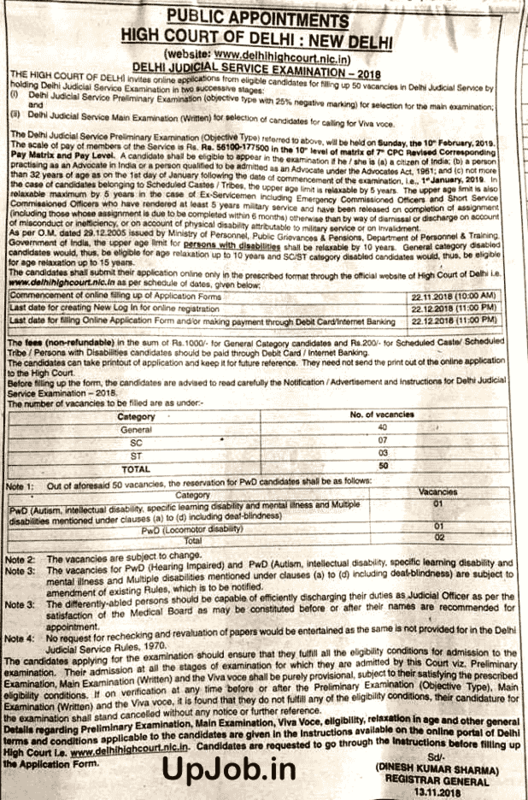 Total no of vacancies for Delhi judicial service are 50 including various categories. Selection of the eligible candidates will be based on through the written examination, main examination and personal interview test. Pre exam will be held on 10 February 2019 at various examination center of Delhi. Selected candidates will be appointed in the pay scale of Rs 56100-17750 in the 10th level of matrix of 7th pay commission. All those candidates who will be declared qualified in the written examination they will be call for main examination. In the last all those candidates who will be declared qualified in the Pre and main examination they will be call for personal interview test. Qualifying cutoff marks: minimum 60% for general and minimum 55 % for SC, ST and PWD candidates. Total 10 time of proposed no of vacancies candidates will be declared in the pre examination. Question will be asked from knowledge of current affairs etc. Hindi (in Devnagri Script) shall be required to be translated into English. Scheduled Tribes and Physically Handicapped (Blind/Low Vision) (mobility not to be restricted)/ Orthopaedically in whose case The qualifying marks shall be 35% in each written paper and 45% in the aggregate The marks obtained in the Viva-voce will be added to the marks obtained in the Main Examination (Written) and the Candidate's position will depend on the aggregate of both.